You may have heard by now that the New York Giants will host the New England Patriots on Sunday in a continuation of their crazy rivalry, which has featured some of the most famous moments in Super Bowl history. Of course, the elephant in the room between the Giants and Patriots will always be Super Bowl XLII when New York used a ferocious pass rush and the Helmet Catch of Doom to end New England’s run at a 19-0 season. However, another Giants’ effort now gets lost in the shuffle due to the legendary win in Super Bowl XLII over the then 18-0 Patriots. Back in 1998, the defending Super Bowl champion Denver Broncos rolled into the Meadowlands with a 13-0 record and oddly enough, winners of 18 consecutive games including the postseason (sound familiar?). The Giants were en route to an 8-8 season. However, a funny thing happened on that dreary day in the Meadowlands. Despite not playing their best football that day, Denver held a 16-13 lead with just under two minutes left. 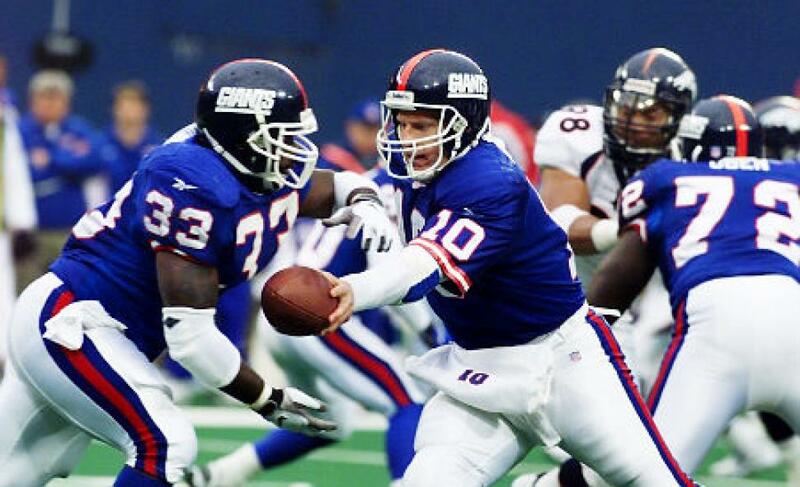 Then, Giants quarterback Kent Graham drove New York 86 yards for a game-winning score including a 37-yard touchdown pass to Amani Toomer. Alas, Denver’s run at a perfect season had been thwarted. The best part of watching this video is having the realization that a non-playoff Giants team beat one of the 20 greatest teams in league history. The NFL just doesn’t make any sense sometimes. Anyhow, the Denver win served as Graham’s finest moment as a pro. Meanwhile, Denver dusted themselves off after finishing the regular season at 14-2. They went back to the Super Bowl and successfully defended their crown.